In 1882, Pierre-Auguste Renoir began a series of « dance » paintings. He had just returned from traveling across Europe visiting England, Algeria, Madrid, and Italy. During his travels, he saw the masterpieces of Diego Veláquez, Titian, Raphael and other Renaissance paintings. After returning to Paris, he lived and worked in Montmartre where he met Suzanne Valadon who would become one of his models. 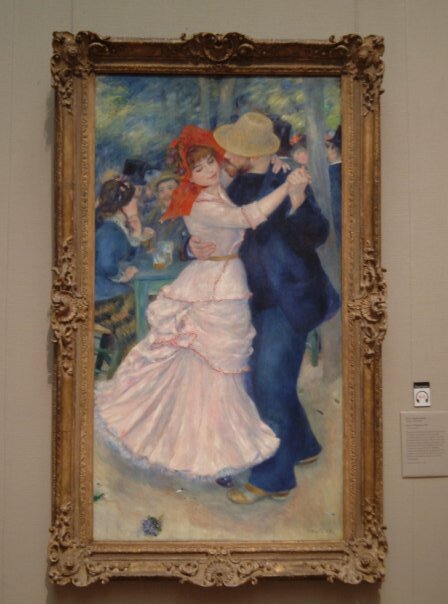 Renoir began work on two large paintings that were to be exhibited together as a pair, “Dance in the City” and “Dance in the Country”. According to the Musée d’Orsay who owns the two paintings, “the elegant restraint of the city dancers and the cool ballroom around them contrasts with the gaiety of the country dance in the open air”. There are even contrasts in the cool colors for the city dance with the warmer colors he used in the country dance. However, they are similar in movement and pose. Currently, these two paintings are in a special exhibition at the d’Orsay “Impressionism and Fashion” and are not displayed in the permanent collection at the d’Orsay. The next year Renoir painted a third “dance” portrait,”Dance at Bougival” which is also part of the current “Impressionism and Fashion” exhibition and is in the permanent collection of the Museum of Fine Arts in Boston. Renoir painted this in 1883 while visiting an “open-air” café in Bougival, a suburb on the Seine just outside of Paris. 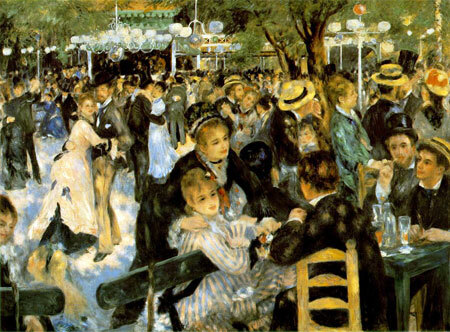 Just as in his “Bal au Moulin de la Galette”, Renoir shows the night life of Parisians which included most of the Impressionist painters themselves. 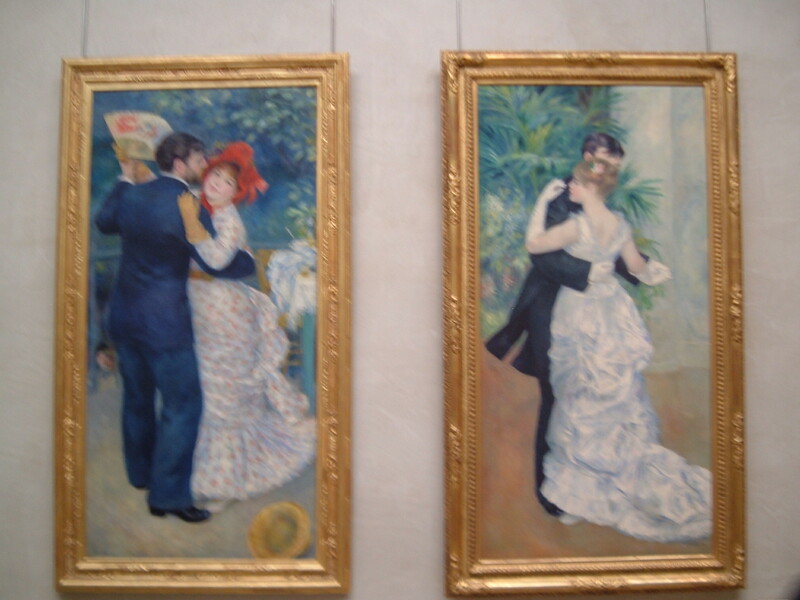 Renoir decided to break from the Impressionist group by the mid 1880s after painting the Dance series and therefore did not exhibit these paintings with them in the 1886 Exhibition which was very unfortunate for those who loved his work. The “Impression and Fashion” exhibition will continue through the end of January 2013 at the Musée d’Orsay.